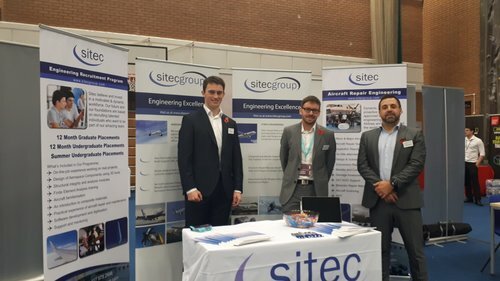 Representatives of the Sitec Engineering Team were excited to attend the University of South Wales (USW) 2018 Opportunities Fair to meet future engineering talent. The Opportunities Fair held on the 8th November 2018 is the University of South Wales largest recruitment event and takes place at the key time in the recruitment calendar. The fair is aimed at students from all disciplines and all years. The Sitec team whom attended the event are all USW Alumni and have gone onto successful Engineering careers with Sitec. This was an excellent opportunity for USW students to meet the Sitec team and find out about the opportunites we offer to Undergraduates and Graduates for placement on our Engineering Programmes. Sitec is committed to developing the Engineers of the future and is excited to offer these opportunities to talented individuals to be part of our amazing team.